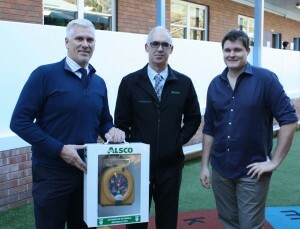 Ray Borg, Northern Region Business Manager of Alsco First Aid, presented the HeartSine defibrillator to Mr Wallis and acting Principal, Mr Steve Connelly, at Mosman Public School. he suddenly collapsed in amongst fellow teachers and pupils. Realising that his heart had stopped, quick thinking colleagues began CPR immediately, called the emergency services and deployed a nearby HeartSine AED. The fully automated device, which talks responders through the entire process, analysed Mr Wallis’ heart rhythm, detected there was no activity and advised that a shock be delivered. This shock saved the young teacher’s life as it was enough to re-start the heart and stabilize him until the ambulance paramedics arrived. “Our devices are designed and manufactured to save lives, and that’s what they do in more than 40 countries across the world. “Once the heart of a patient has stopped, the only way to re-start it is through the shock of a defibrillator. CPR alone is not enough to re-start the heart and we know that for each minute defibrillation is delayed, the victim’s chance of survival decreases by up to 10%. The HeartSine Forward Hearts Program sees the company, which has headquarters in Northern Ireland and the United States of America, donate a defibrillator to an organisation of the choice of each person saved by one of their devices. Mr Wallis chose to place the defibrillator donated to him in his place of work, Mosman Public School, to provide fellow teachers, pupils and visitors with the greatest chance to survive sudden cardiac arrest (SCA) as he did. Working in partnership with Aero Healthcare, a HeartSine Authorized Distributor in Australia, Alsco First Aid provided training sessions to members of staff ensuring they have the knowledge to locate and use the device confidently, should it be required. Since then, the school has decided to invest in a second defibrillator which can be taken off site on school trips, providing the school community with even greater access to the life-saving technology. For more information on acquiring a HeartSine defibrillator for your school or place of work, please contact your local distributor.